Jonah Berger first caught my attention in this Fast Company article ("Fifty Percent of 'The Tipping Point' is Wrong"). The article positions him as the new Malcolm Gladwell and in fact points out a number of flaws with The Tipping Point findings. To his credit, Gladwell was not defensive, pointed out that he is a writer and story teller and conveyed respect for Berger. Berger is a Marketing Professor at the Wharton School of Business. At Stanford, he was a student of Chip Heath, author of the marketing classic "Made to Stick". Made to Stick describes why messages stick with audiences. Berger has taken this concept a step further in his bestselling book Contagious: Why Things Catch On. Berger examines why certain products get more word-of-mouth marketing and why some online content goes viral. 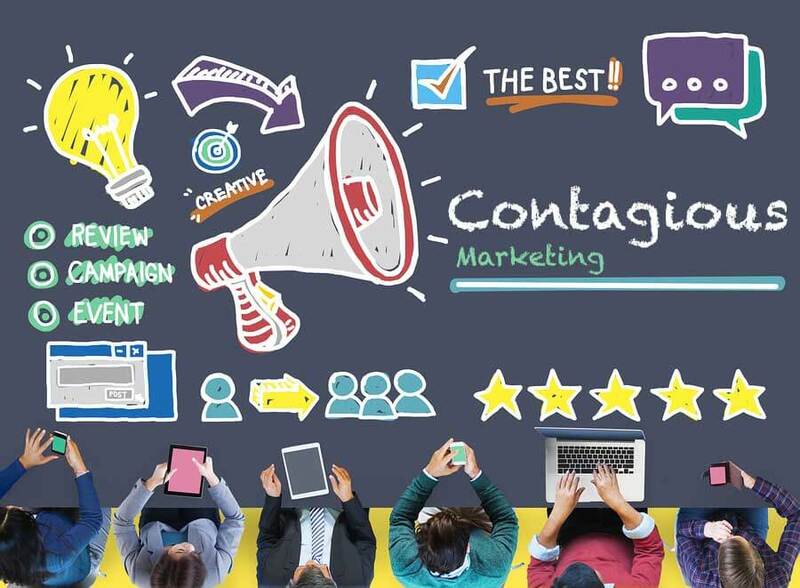 In the Fast Company article, Berger says marketers have been obsessed with the wrong part of the viral equation. "By focusing so much on the messenger, we've neglected a much more obvious driver of sharing: the message," he writes. The Tipping Point's notion that social epidemics are driven "by the efforts of a handful of exceptional people, is just plain wrong." Social Currency. We share things that make us look good. For example, if we are able to inform other people about a trendy new smartphone app that we discovered, it makes us look good…and, increases usage of the app. Triggers. Ideas that are top of mind spread. Ideas become top of mind when they are activated by triggers which make people easily think of the product. Cheerios gets more word-of-mouth than Disney because it is so strongly associated with breakfast. Emotion. When we care, we share. The author even cited tests where people who learned something during physical activity were more likely to pass along the concept. Public. People tend to follow others, but only when they can see what those others are doing. Steve Jobs designed the Apple logo on the Mac so other people could see it when someone else is using a Mac. Ideas need to be public to be copied. Practical. Humans crave the opportunity to give advice and offer tips...especially if they offer practical value. Berger has identified this ‘paying it forward’ to help others. No one will share a product or idea that does not have practical value to others. Stories – People do not just share information, they tell stories. And stories are like Trojan horses that carry ideas and brands. To benefit the brand, stories must be interesting and also relate to a sponsoring company’s products. This is a very interesting book and has a lot of great advice for marketers and product positioning. I do have two criticisms of the book. First, many of the stories are common knowledge. For example, the "Will it blend?" viral video series. So, while Berber may have the more scientifically sound theory of why ideas and products stick, he doesn't have anything on the interesting stories that Gladwell shares in his books. 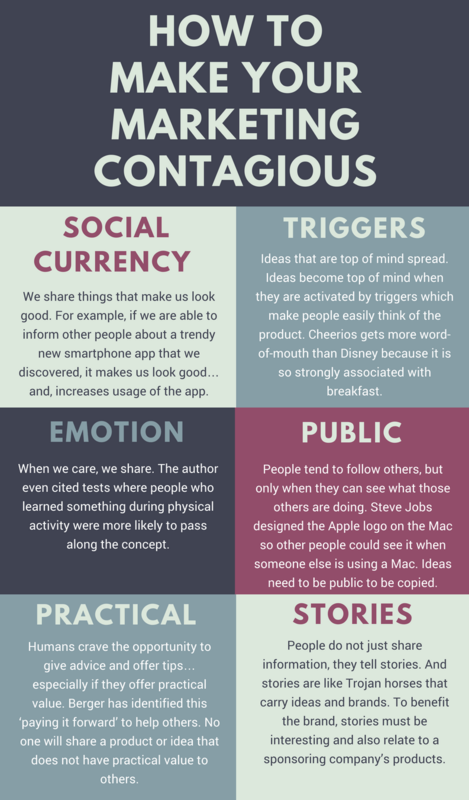 Second, Berger also explains that you can pick and choose which of the six viral reasons to use in your messaging. He said you can use one or select a couple to apply. This is a bit disconcerting. Perhaps the next round of Berger's research will better package the six reasons. It is possible that certain packaging will work better than others; or that packaging too many will confuse your audience. That being said, I would recommend this book for any marketing professional. Which of these techniques have you applied to your marketing efforts? Did they work? Have you tried to package multiple techniques? We'd appreciate your comments.